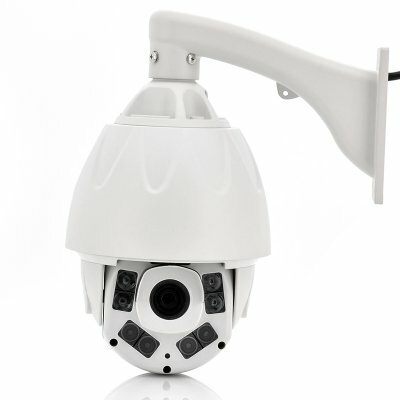 Successfully Added Full HD Outdoor Security Dome - 1/3 Inch Sony IMX036/122, 1920x1080p, PTZ, H.264, 18x Optical Zoom, 100M Night Vision Range to your Shopping Cart. This Full HD Outdoor Security Dome features a 1/3 Inch Sony IMX036/122 image sensor that produces 1920x1080 pixel full HD video, pan/tilt/zoom (PTZ), H.264 video format, 18x optical zoom plus night vision up to 100 meters. Don't let anything go unnoticed with this ultra crisp, Full HD Outdoor Security Dome with a Sony 1/3 Inch IMX036/122 CMOS sensor. When it comes to your protection, you should be able to see threats clearly. Your family will thank you for choosing the best IP camera on the market in terms of clarity. Those who adapt, survive. That's why this Full HD Outdoor Security Dome comes with the ability to adapt its angle to point toward the target at hand. Don't let anything get away and keep your family safe. It also has night vision for up to an astounding 100m, making it impossible for bad people to creep up on you. In stock now, we guarantee that this Full HD Outdoor Security Dome can be dispatched within one working day with a 12 months warranty. Brought to you by the leader in electronic devices and wholesale PTZ IP Cameras, Chinavasion.